As I’m working on a writing project this week, I have been reading through some of Johannes Kepler‘s book, Harmonices Mundi (Harmonies of the World) (1619). 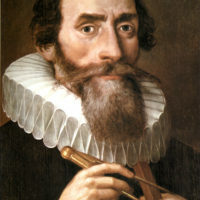 Kepler was discussing a fascinating correlation he discovered between the interdependence of planetary motion, geometry, and musical harmony. Admittedly, I am, intellectually, to Kepler what a paper airplane is to a fighter jet. So many of the details of his discoveries are way over my head. However, what struck me is what happened to Kepler at the very end of this essay. He was so overcome by the beauty and precision of the obviously created universe that he burst into spontaneous worship, thinking about how he (and us) should then live in light of the knowledge that God has made all things for His glory. If your child’s textbooks and education don’t point him or her toward spontaneous worship at the majesty of Christ and His creation, then you are doing it wrong, and you need to throw out your curriculum and get a new one! Israel Wayne is an Author and Conference Speaker and the Director of Family Renewal, LLC. He is author of the book, Questions God Asks: Unlocking the Wisdom of Eternity. He is also the Site Editor for www.ChristianWorldview.net. We are going through some paradigm shifts on education at our home, and looking to get rid of a lot of our curriculum that we have purchased in trying home educate. As we look more into educating the soul to know, love and pursue God and His ways- Do you have a high school curriculum you would recommend? (that does what you say? Point them to spontaneous worship at the majesty of the creator?) I have heard Brooke mention in a podcast that she likes Math Made Meaningful for the younger ones- would you guys be able to share what you have found to be Biblical choices in school material for older ones? Thank you so much!